← Why Yes, I Do Have A Blog! Just because I am not blogging about them, doesn’t mean I haven’t been trying new things! One of the things I made for my birthday was my very first homemade cheesecake. I decided to make a baked cheesecake because a no bake cheesecake it not even a real thing because it is my favorite dessert. Now, as you all know, I have been working really hard to eat clean and be healthy. I definitely made a healthier version, but also kept some of what makes a cheesecake a cheesecake. I also got close to 16 slices out of it, which made it a pretty good choice, but it is definitely still a treat! This was the most perfect dessert! I was so impressed with myself! Everyone loved it and it was devoured within 20 minutes! I have already been requested to make it again! *Make sure ALL ingredients are room temperature before making the batter. This includes the eggs! First, blend only the cream cheese. Then, add the sour cream, yogurt and vanilla. Then, when blended, add in the eggs one at a time. Do not over mix the batter; you want to avoid getting too much air into it, which will keep it from baking correctly. Take out and let cool to room temperature for approx. 30 minutes. After the cake has cooled, apply the icing and then bake at 325 degrees for 10 minutes. Cool for one hour at room temperature. 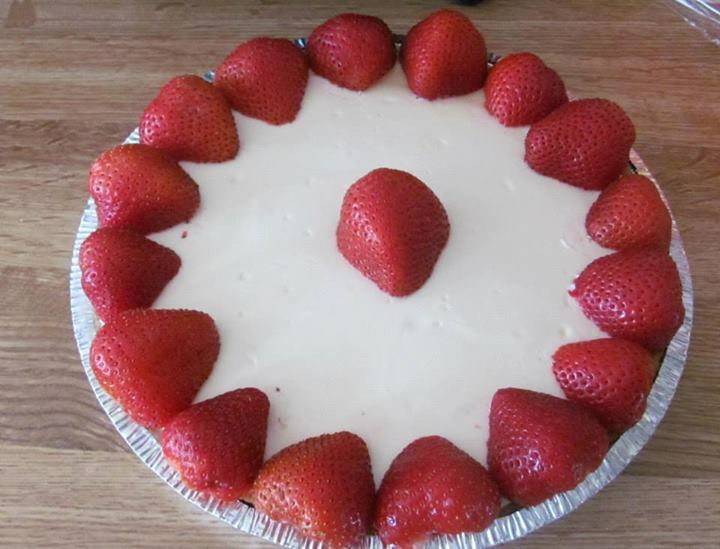 Posted on July 25, 2014, in Food, New Food Friday, Recipes and tagged cheesecake, healthy desserts, homemade, new food friday, recipes. Bookmark the permalink. 2 Comments. Yay! Congrats on your first cheesecake. Looks delicious! Yum! I’ll have to try this one out. My father-in-law makes really yummy cheesecake but unfortunately it’s loaded with fats and sugars. Yours would make a great substitute. Thanks for sharing!